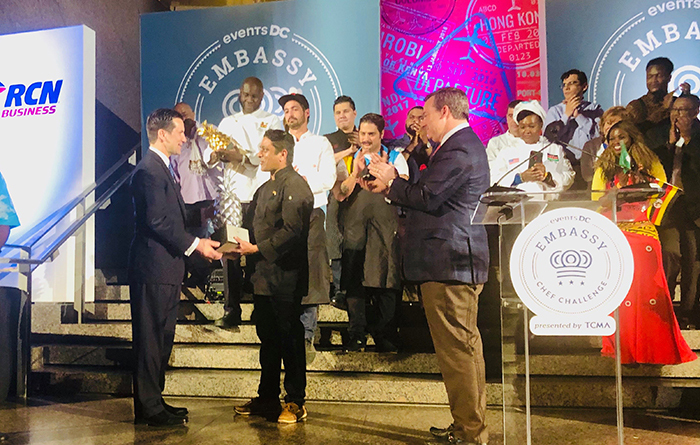 At the 11th International Chef Challenge concluded at the Reagan International Trade Centre in Washington DC on 02nd April 2019, Chef, Anuradha Wijesinghe who represented the Sri Lankan Embassy in Washington DC, won the People’s Choice Silver Award. 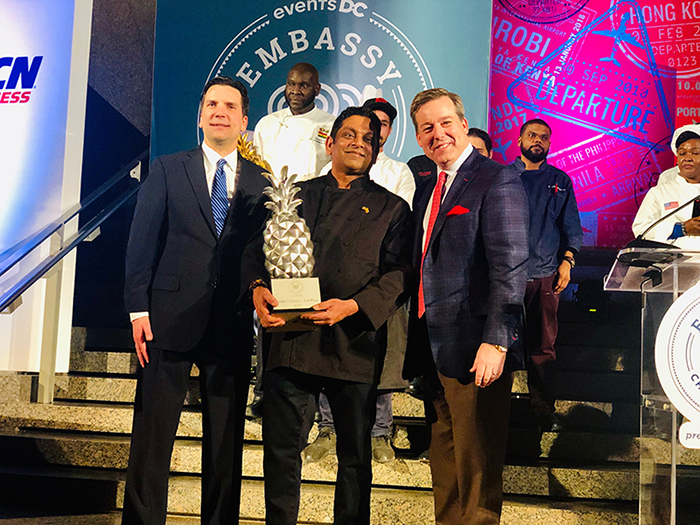 This is the first time an officer from the Sri Lankan Embassy has been bestowed such an award by the International Chef Challenge since its inception in 2007. 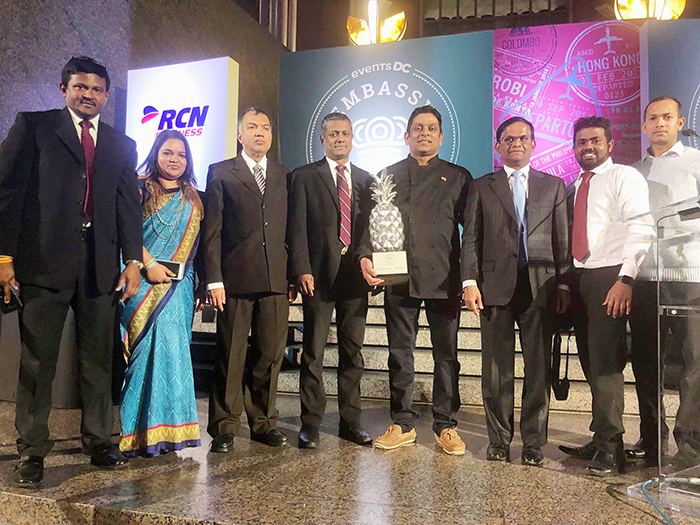 Chef, Anuradha Wijesinghe has been chosen for this coveted Silver Award based on the second highest number of votes he received at the Chef Challenge. 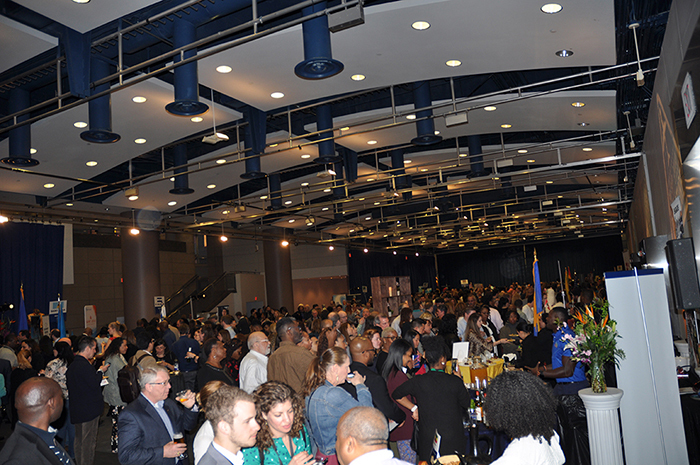 Over 30 Chefs participated in the 2019 International Chef Challenge – dubbed the “ Food Olympics “ by the diplomatic community in Washington DC for its rich and diverse character with presentation of culinary delights and authentic cuisine of exquisite nature by chefs representing all geographical regions around the world. At the International Chef Challenge on 02nd April, Chef, Wijesinghe presented a wide variety of Sri Lankan dishes in unique tastes and forms to suit the palette and appetite of a truly international gathering of food enthusiasts and lovers, who flocked in numbers to the Sri Lankan booth to taste Sri Lankan cuisine of international standard. 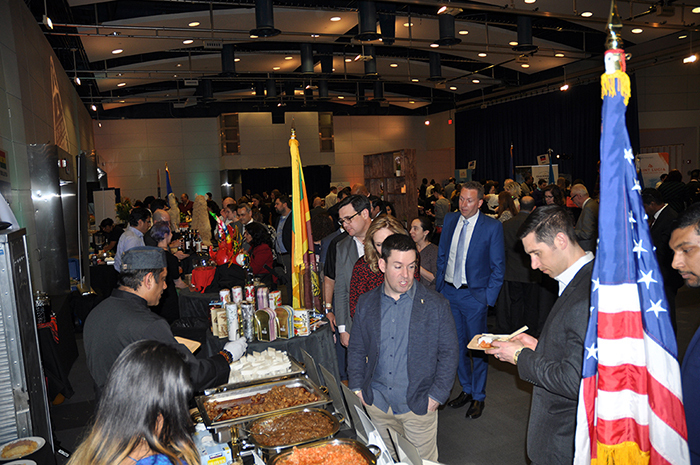 Given that over 700 people visited the Sri Lankan booth over a period of 3 hours, Embassy staff had a nerve – racking experience in attending to those who queued up outside the booth for mouthwatering Sri Lankan dishes and appetizers. By winning the People’s Choice Silver Award, Chef Wijesinghe has made Sri Lanka proud which will go a long way in promoting Sri Lanka and its culinary diplomacy among the diplomatic community in general and the Americans in particular, at a time Sri Lanka has been ranked the most sought – after travel destination for 2019, by the Lonely Planet magazine. This year, the Embassy of Sri Lanka had the distinct honour and privilege of hosting the “curtain raiser and media preview dinner “of the 11th International Chef Challenge at the Sri Lanka Residence on 20th March which brought together a large gathering of sponsors, well wishers and members of media leading up to the successful completion of the 11th International Chef Challenge on 02nd April 2019. 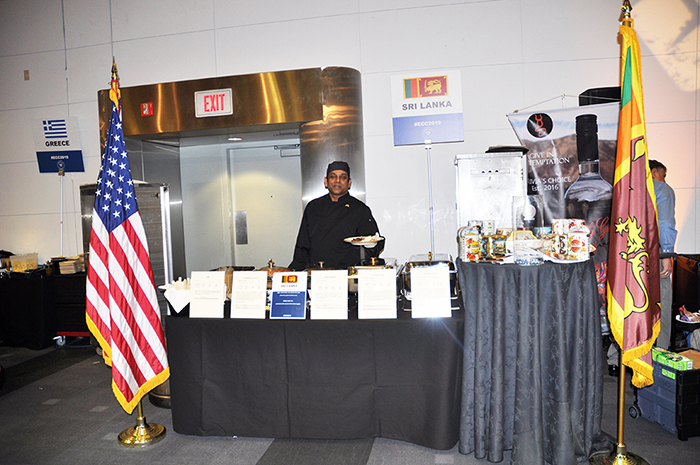 The Commercial Section of the Embassy coordinated and supported Sri Lanka’s participation in this year’s International Chef Challenge. 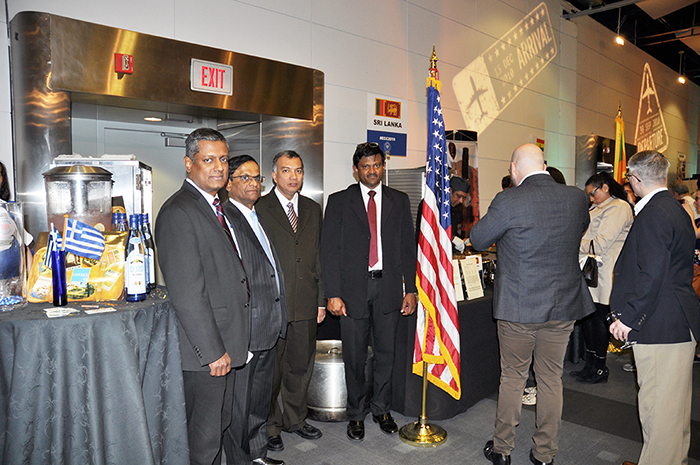 The Sri Lankan booth also promoted Sri Lankan tea and tourism with the display of tea and tourism products.